Excessive intake of sodium and added sugars in association with increased risk of cardiovascular disease (CVD) and obesity in adults and children were some of the most important headlines of 2016, and I predict these issues will remain in the headlines throughout 2017. Why? Because the health of our entire nation is at stake, and dietitians need to know how to counsel clients to successfully reduce sodium and sugar in their diets. Exactly one year ago, the 2015–2020 Dietary Guidelines for Americans recommended limiting daily added sugar intake to 10% of total calories and recommended that children under age 14 consume less than 2,300 mg sodium per day; shortly after, the FDA issued its final rule requiring all Nutrition Facts labels to include a line for "Added Sugars" and %DV for added sugars; more recently, the American Heart Association released its first-ever scientific statement recommending that children and teens aged 2 to 18 consume less than 6 teaspoons (25 g) of added sugars per day and no more than 8 oz of sugar-sweetened beverages per week (see the December 2016 issue of Today's Dietitian). And just two months ago, researchers from the Centers for Disease Control and Prevention published a new study in the Journal of the Academy of Nutrition and Dietetics that examined the eating habits of 2,142 children between the ages of 6 and 18 based on data from the 2011–2012 National Health and Nutrition Examination Survey. They found that 90% of the kids surveyed exceeded the upper level of sodium recommended for their age group, putting them at risk of hypertension in their youth and heart attack and stroke in adulthood. What's more, excessive intake of added sugars in children is especially concerning because its link to obesity often leads to developing CVD risk factors in childhood, including hypertension, insulin sensitivity, type 2 diabetes, dyslipidemia, and ultimately CVD, among other diseases. In this issue, Today's Dietitian features an article on the association between obesity and various cancers in "Cancer's Link to Body Fat," on page 34. We also have an article titled "Metabolically Healthy Obesity," which may seem contradictory, but some obese people do experience metabolic health even if it is for only a short season. 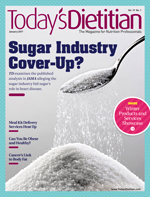 Also in this issue are articles on the alleged sugar industry cover-up, the most popular meal delivery services to share with clients, and our exclusive interview with Hope Warshaw, MMSc, RD, BC-ADM, CDE, FAADE, former president of the American Association of Diabetes Educators. Please enjoy the issue!